Refer my post and email dated June 29, 2015 – Greece Crisis What Should You Trade. On that day I told you that VIX has increased considerably and it is a great time to sell out of the money options and also hedge them by buying options. People who had done that may be in good profits now. 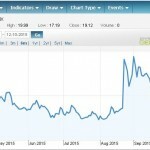 The VIX has come considerably down and its hovering near 15.41. From 18.18 to 15.41 in 3 days. This is a drop of 15.25%. Excellent for sellers. Both the calls and puts option premiums would have shrunken and the trade can be taken off. As the small profit wherever that may be has been achieved there is no need to stay in the trade. See its profit vs time. 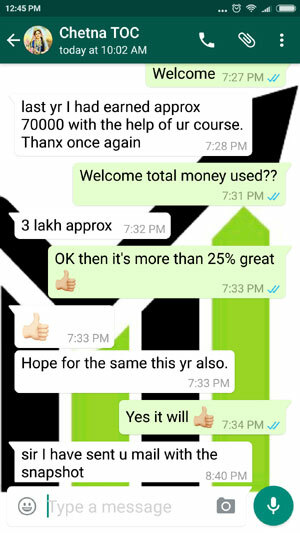 Even if the profit is 2% – it has come pretty fast in 3 odd days. Is there any need to be greedy and wait for the options to decrease more in value? We made a quick profit and we should exit. 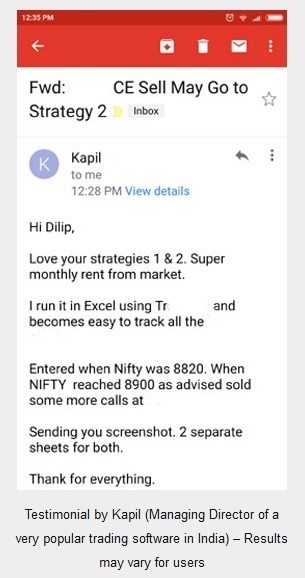 This is how a good trader takes his trade. The original plan was to make a quick profit – so no matter what happens we will NOT alter that plan. Kill that devil called GREED and you will become a better trader I bet. Situations like this can bring in quick profits. 🙂 So we must look out for such situations. Since VIX is directly related to world news and happenings we can make use of it to decide, to some extend, time to sell or buy options. Well that does not mean we will never be wrong. We can be and there should be a plan to exit. For traders who have taken my course the plan is to go straight to Strategy 2. If you haven’t taken my course and reading this you can make your own plan – whatever it is, be a stop loss or adjustments. But you must TAKE ACTION when things go wrong. Moreover Nifty also remained in a range – low of 8195 and currently around 8460. Those 200-300 odd points movement does not matter when VIX has decreased considerably because even if one option will lose money the other makes more than the losses. Ultimately the trade is in profit. When VIX increases take you chances. 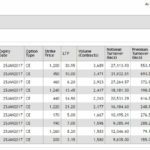 Sell options and hedge them properly, set your target profits and exit. But you must also have a Plan B if VIX does not decrease or if anything goes wrong. 1. You get a FREE eBook on 24 great option strategies written by NSE – yours to keep forever. 2. 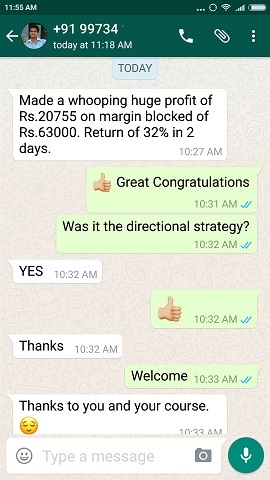 Instant trading tips notification if any situation arises. 3. Get notified as soon as a new trading strategy is written in this site. 4. You learn something new in every email. 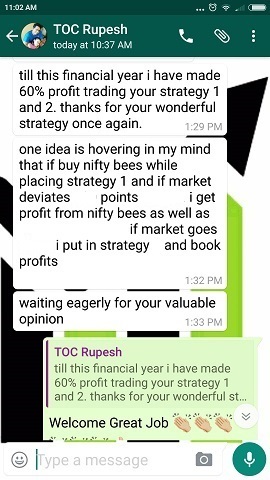 Keep such timely articles coming…..it only adds to the strength of the trades that we take as per what has been taught in your options course. Today, I want to touch upon the oft repeated maxim ” Ride your winners and cut your losses”. Indeed, I know that greed has to be under control as you have very rightly stressed above – there is no denying that… but say for example….if one has cut his losing trade immediately…. but is riding (carrying) his winning trade as should be the case. In such a scenario…. where does one draw the line as far as greed is concerned. 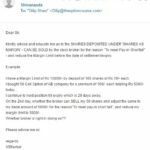 Would carrying the winning trade tantamount or be inferred as greed…. and should the person get out even as the going is good. Or does the maxim apply more to Investment… rather than Trading. In simple terms… how does one stick to the above discipline… and yet not be labelled greedy? Allen, Great question. Frankly I cannot answer this in a small comment. I think next week I will write on this. It needs its own post. Thanks for the question. According to me strictly Follow the Plan…!!! Once u reach ur target just exit….!!! JACKPOT in 1 single trade.What was happen .ie.past…so just Move on. So it is better to be Happy with Profits u Earned by following a trading plan. Abhishek, yes when you look back at a trade you may feel bad that you could have made more (it does not depend how much – because even if it was 10 points you could feel bad because that was real money lost.) However what you are not looking or adding are those points that you could have lost by not taking the stop loss at a correct time. Over a period of time you will see that the losses far exceeds the profits and only discipline saved you from such huge losses. Another benefit of being discipline is that you do not look back at your trade after expiry and that helps to cut-off emotions relating to â€œwhat could have happenedâ€. Since you are not bothered with the past you take correct decisions in your next trade. I write the results of the trade and write down what I learned from it and move on. Even now almost every trade teaches me something or the other. You cannot stop learning else you stop earning.